I’m fortunate that my work takes me to Europe several times a year, but I try to go on my own at least once each fall or winter. Sometimes I travel with my husband or accompanied by one of my adult children, and that’s always fun. But I’m just as happy to go solo, to walk down streets that have seen the cultural history of the world unfold and come home richer for the experience. In the past I looked for a direct flight to Frankfurt or London or Paris. But the 10 or 11 hours in the air, flying directly to or from Seattle, San Francisco or Los Angeles, took their toll on me. Especially on the way home. For a week or more after my return, I was fatigued and weary, fighting the confusion and physical effects of jet lag. I couldn’t get a lot done. I began to talk about this with other travelers who live on the western side of the country and I realized I wasn’t alone. Jet lag, when returning from Europe, seems to hit us harder. It finally dawned on me that maybe a direct flight isn’t necessarily the best idea. I may save a little time but I pay for it in other ways. If I give myself a few extra days on the east coast--usually New York City--to adjust before continuing my trip further west, I come home more rested and less likely to suffer from extreme jet lag. I have put this theory to the test several times now and it makes all the difference. Now, whenever possible, a trip to Europe ends in one of two ways: an extra night or two in New York or a few days on a short cruise out of New York. Then, at the end of my mini-vacation, I catch a flight home with only a 3-hour time adjustment. For my return from a recent assignment to write about France’s World War I western front, the Millennium Broadway Hotel’s “Fall into Autumn” package was perfect. I had some additional WWI research to do at the library and a couple of private museums, and I wanted to see a show or two while I was there. I booked a room for three nights in early October. My Air France flight arrived at JFK Airport just after 4 p.m. After clearing customs I hopped in a taxi and took the 45-minute (rush hour traffic) ride to the hotel. Once there, I checked in, showered, and made myself a cup of tea. By that time it was almost 8 p.m. My room was on the 45th floor and overlooked Times Square. It was fun to watch the crowd with a bird’s eye view as I rested and answered the emails that had jammed my inbox after two weeks away. I had two more nights so I didn’t feel pressured to immediately go out and play. I made another cup of tea, fished around in my bag for an energy bar for dinner and went to bed. The next morning I woke up early, still on Paris time, and watched the sunrise paint the skyscrapers surrounding the hotel. I’d slept well and I was ready to get to work. 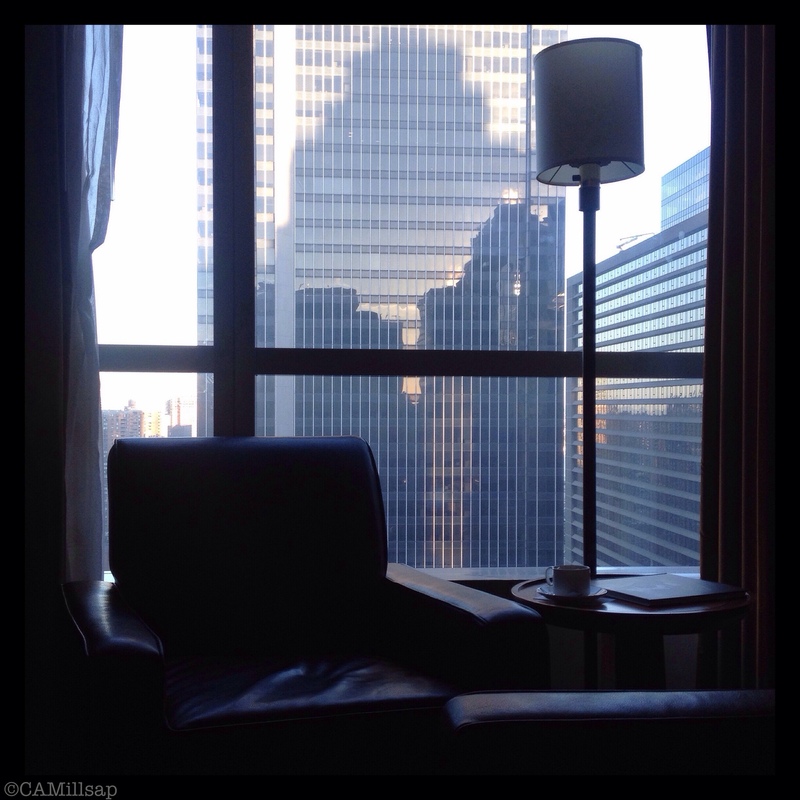 The Millennium Broadway sits between 44th and 45th Streets and the location is perfect. The lobby is always a hive of activity, but the rooms are quiet and spacious ( especially by Manhattan standards.) The hotel is right in the heart of the theater district and within easy walking distance of all the other places I wanted to visit while I was there. The exercise revived me. Each morning, after a breakfast of oatmeal and coffee in the lobby restaurant, I felt ready for anything. By the time I flew home I’d adjusted to the time difference without any jet lag and I was far more productive than I would have been without the Big Apple break.